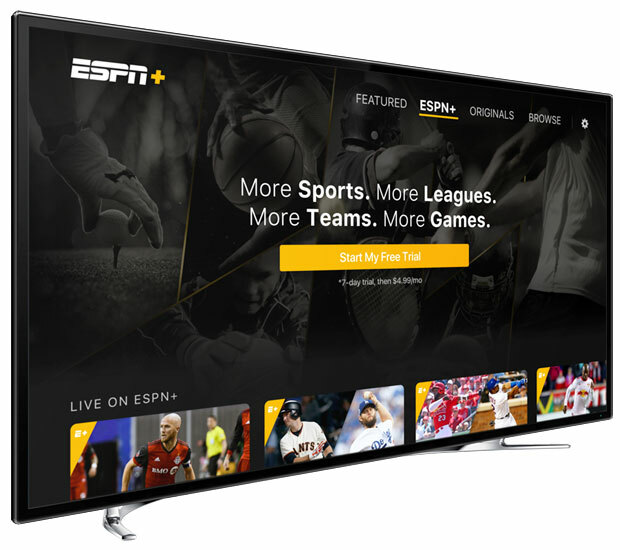 Disney on Thursday introduced EPSN+, an all-in-one, direct-to-consumer premium streaming service that offers thousands of live sporting events as well as original series and films. It also will provide access to the vast ESPN on-demand library. ESPN+ is the first such premium service from The Walt Disney Company’s Direct-To-Consumer and International Group through a partnership with ESPN. The release of ESPN+ coincides with the release of the free ESPN App, which features five primary navigation menus. Viewers can catch live events; check scores; watch news and analysis; view video clips; or listen to ESPN Radio content. In addition, the new ESPN app provides authenticated live and on-demand access for TV subscribers to the U.S. linear and digital networks, including ESPN, ESPN2, ESPN3 and other ESPN TV properties. ESPN+ is akin to overtime play or extra innings for serious sports fans. It includes coverage not carried on the ESPN channels or much more in-depth coverage than programming found there. Among its offerings are MLB, NHL and MLS games not already covered, as well as Grand Slam tennis, Top Rank boxing, the PGA Tour golf, and many college sports. International sports such as rugby and cricket also are featured. The premium service offers the same functionality as the ESPN app, including the ability to pause, rewind and restart live programming. It features limited advertising. There are no display ads and no pre-roll ads with ESPN+ exclusive content; however ads will appear in the natural advertising breaks of live events. The ESPN app is available for Android, iOS, Apple TV, Chromecast, Fire TV and via the Web. No separate ESPN+ app is needed — the content is accessible on the current ESPN app to viewers who sign up for the premium service, which is available for US$4.99 a month or $49.99 for a year. A seven-day free trial is now available; those who sign up for it by April 18 will have the trial period extended for 30 days. Part of the draw of ESPN+ could be original content, beyond the sporting events, including documentaries and other ESPN exclusives. The short-term strategy is similar to CBS All Access, which includes exclusive content as well as content from the broadcast network. This approach signals an effort by media companies to change the delivery method while following the traditional TV content model. “The strategy that Disney is pursuing is more like carving up the audience than what Netflix and Amazon have provided,” said Dan Cryan, senior director of digital media for IHS Markit. “Right now, ESPN+ is really a collection of less valuable content, and it may need to move the more valuable content to bring over more customers,” he told TechNewsWorld. However, “this is just the first step in Disney’s longer journey towards direct-to-consumer services,” added Joel Espelien, senior analyst at TDG Research. “It is a learning exercise in every respect, and I would expect everything from the price to the content and even the name to evolve,” he told TechNewsWorld. Disney’s move with the new ESPN app and ESPN+ will allow the targeting of content directly to cord cutters and cord nevers — and that could be an unsettling portent of the future of traditional pay-TV platforms. Content is the key, and ESPN+ initially may not deliver enough to grab mass audience attention. “The services that are doing really well and leading the market are those who provide a far fuller bundle of content than traditional channels — they are fat channels and include players like Netflix and Amazon,” noted IHS’ Cryan. It is unlikely that individuals will subscribe to every offering from Disney/ESPN, HBO, CBS and others — or it could result in their paying even more than the cost to subscribe to a cable or satellite service. However, Disney could include content from its other programming channels — Disney, ABC and others — in one offering. One possible future scenario is that the major sports leagues won’t need ESPN — instead, they will provide content directly to fans via streaming services. Major League Baseball already offers content to fans, noted Cryan, but it may be an exception rather than a trendsetter. “There is simply more baseball than can fit on a traditional TV schedule, but when you get to other sports there just aren’t that many games,” he pointed out. “Fast-forward five years, and we could see more games from the pro league that are offered directly to the consumer — but the challenge is that there aren’t enough mass market sports fans,” Cryan said.